"This audio recording is designed to teach you how to get the life you want through meditation. Wouldn’t it be nice to just relax completely and use meditation to improve your life? Well that’s exactly what you are going to do as you listen to this recording. This recording will help you to improve your life by experiencing present moment awareness, re-energising your body, improving your health, enhancing your mind/body awareness, and giving you clarity and calmness of mind. Get the Life you want through Meditation, relates to different areas of life where meditation can make a difference, and our intention is that this audio book will make a life changing positive difference in your life. Whether you are a beginner or you have been practising meditation for some time this audio book will help you to make positive changes. We have placed Meditation for “deep restful sleep” as the very last track, after the summary and conclusion, so you can continue to sleep undisturbed after you use this track. You are making a conscious decision to make positive changes in your life now with the help of this audio book. You can get the life you want and make necessary changes by understanding and applying the meditation techniques brought to you. The Author; Virginia Harton, a fully qualified meditation practitioner and yoga teacher, started using meditation skills in her late twenties and believes it has changed her life in so many positive ways. Virginia has also trained in various healing modalities and holistic therapies, which involve various types of meditation tools. She works with mindful breath awareness, total body relaxation, guided visualisation, Neuro Linguistic Programming - NLP and mindfulness. The content of this audio book relates to different areas of her life where meditation has made a difference, and her intention as an author is that this audio book will make a life changing positive difference in your life. As you listen, take part in the guided meditation exercises, relax, and visualise the affirmations and guided imagery. 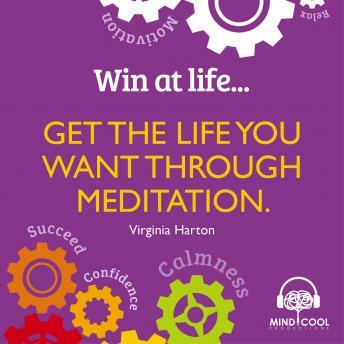 Get the Life you want through Meditation is one title in the Win at Life self-help audio and eBook series published by Mindcool Productions. "